If there’s anything I learnt from it, it’s that it’s possible to be in two place simultaneously (minus hallucinogens). I had four back to back days off last week and I wrote down a to-do-list for each day. Of course, nothing went according to my silly plans. My mother was in the hospital again and when one is in such long-distance relationships with parents, one worries and wallows. That would be me. To make all these feelings a little more intense, my sister Jane and her husband took off on a life-changing trip to pick up their sweet new baby from the children’s home in a different state. Apart from my dad, she was the only other family member who could be there with my mother and wasn’t off in another country like some people >__<. Off they went and my dad, my family’s friends, my sister’s friends, Roma and one of my friends all tag-teamed to be with my mama during her hospital stay. I feel so appreciative and sad at the same time. There are some really good people on this planet and I’m so lucky they chose to be ours. Most of all, my father is amazing. I’ve seen him take care of many people in his life but nothing crushes me (in the best ways) more than watching him take care of my mother. This week has been weird. Had some bad news and great news. My sister and her husband finally got to see their baby after months of work and waiting and my mother is in hospital again for the much-too-many-th time. I have idea what or how much space to let either bits of information occupy but being a silent observer of small moments, I can’t help but feel that this is how it always is: Endless sideways curly wave motions with your hand. All the while she was in hospital, she would group text with one hand – thanks IV lines – about finally getting to see baby feets. I hear they are adorable and babies are sooo soft. It’s been a while since I’ve been around one. My last baby was Cynthia and I still think she is adorable (look at her!). I can’t wait for my parents to finally see Jacob Francis and snuggle him (DONE. My sister and her husband surprised all their parents by coming home early). Heck, I can’t wait to see him either. By the time you read this, I will have seen him on Whatsapp video 5 times. IRL cannot come soon enough. I was going to make doodh pedas – my sister’s favourite sweet – to celebrate the little boo. I still might in a little while but before I do, I wanted to share with you this grapefruit yogurt cake that was inspired by the grapefruit poppy seed bundt my friend Izzy brought me when I cried out for help from my anxiety pit last week. My mama has been back home and recovering well as of Tuesday. Her arms are a bit roughed up from all the needles but I know she’s glad to be back in her own bed, near my dad, united in their inability to resist Ninja sticking to their legs under the covers and ready to take on their new roles as baby snuggling grandparents. Notes: Since I was feeling so creative this week, I changed the yogurt glaze from the original recipe to just plain Greek yogurt with a liquid sweetner and poppy seeds. It did the trick very well. The most important think to know – captain obvious – is to keep the yogurt chilled once you mix it up and spread it on a cooled slice of cake. If you have no self-restraint (I don’t blame you), the cake will still taste good because you made it on the best/worst week of March 2017 and that’s all that matters really. 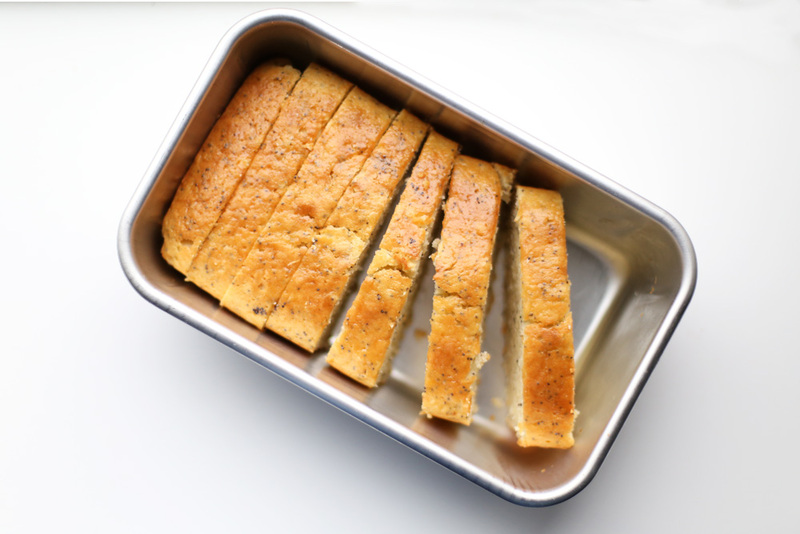 Heat the oven to 350° F. Grease a 9×5 loaf pan with butter or baking spray and line it with parchment paper, leaving overhang on the long sides. Whisk the flour, baking powder and salt in a medium-sized bowl. Using your fingers, press the grapefruit + lemon (if using) zest into the granulated sugar in a large bowl. The sugar should start to smell bright and citrus-y which will mean it’s ready. Add the eggs, oil and vanilla extract to the sugar and beat with a whisk or an electric beater on high until the mixture is light and fluffy. Using just the whisk, mix in half of the flour mixture, stirring only until no streaks of flour remain. Add the 3/4 cup of yogurt and mix in the rest of the dry ingredients, 5 tbsp of grapefruit juice and the poppy seeds. Again, try not to overmix and whisk only until you have a uniform batter (it shouldn’t take much). Scrape batter into the prepared pan and smooth the top. Bake the cake until the top is golden brown and and your kitchen smells like tea time, about 55-60 minutes. Insert a toothpick into the centre of the pan to check if it’s done. Done = clean toothpick with no crumbs. Transfer the pan to a wire rack. Poke holes in the top of the cake using the same tester toothpick. 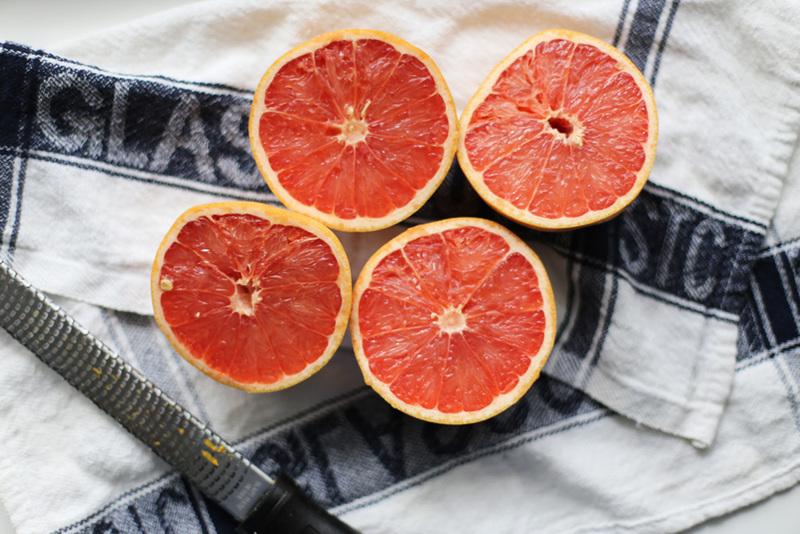 Brush the remaining 3 tbsp of grapefruit juice over top. Let the cake sit for 15 minutes, and then carefully unmould the cake with the help of the parchment paper overhang. If there’s too much resistance, loosen the cake by running a butter knife along the sides. 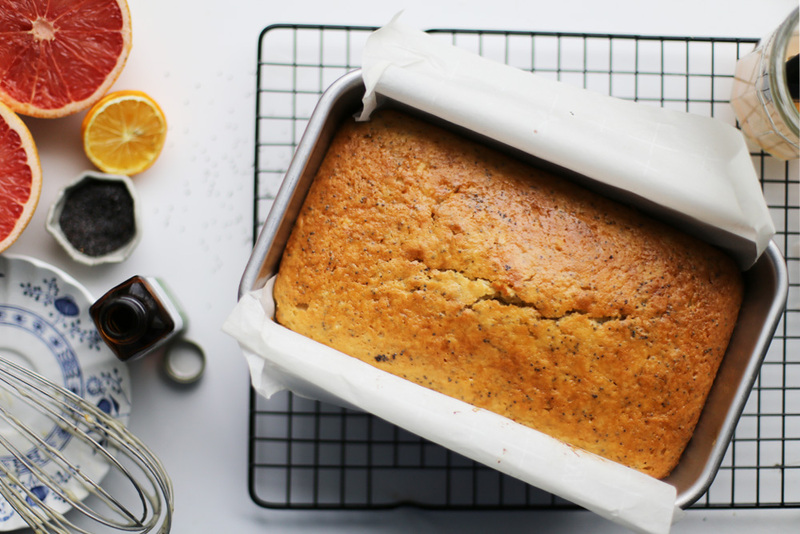 Remove the parchment from the cake and let it cool completely on the wire rack. 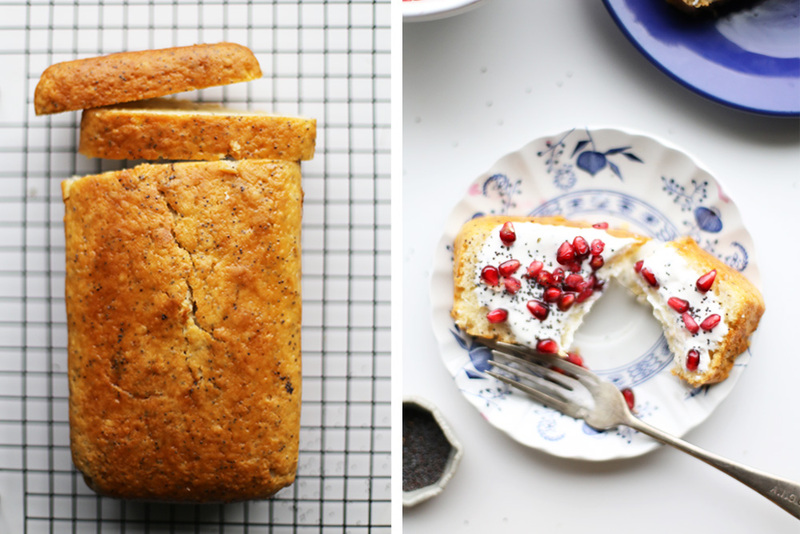 Once cool, cut thick slices (Texas toast style) of cake. To make the easy frosting, scoop 1 cup of Greek yogurt in a serving bowl and add the maple syrup and 1 tsp of poppy seeds. Mix well and place it back in the fridge to let it set a bit. 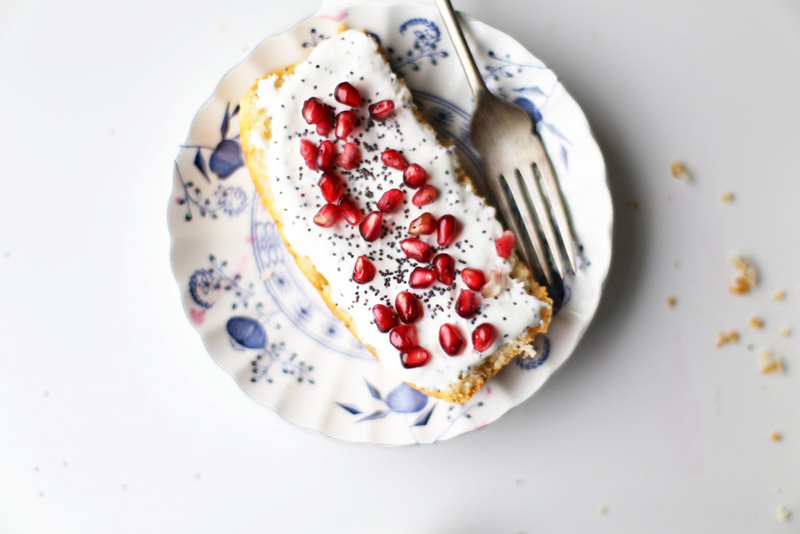 Serve the cake smeared with chilled yogurt and top with pomegranate seeds for garnish. The cake will keep covered on the counter-top for a week. I just used a clean dish towel for the cover. Enjoy! Jacob is waiting for A. Edna to come visit. He will be a whole year old when that happens. Let’s not call me EDNA. This recipe sounds great – I personally would change the grapefruit juice to orange juice (due to bad reactions for people on certain meds). Glad to hear that your mum’s home – she sent us a message (we were in the Bahamas for 4 nights and 3 days, just got back on Thursday). Keep up the good work – I love reading your blogs. Hello Nilda, wish I could have met you in Seattle last week too. You should try to come visit sometime. Although, so should I! (visit Canada, that is). Thanks for letting me know about the reactions people could have to grapefruit. I’m sure you could use lemons or orange as well. 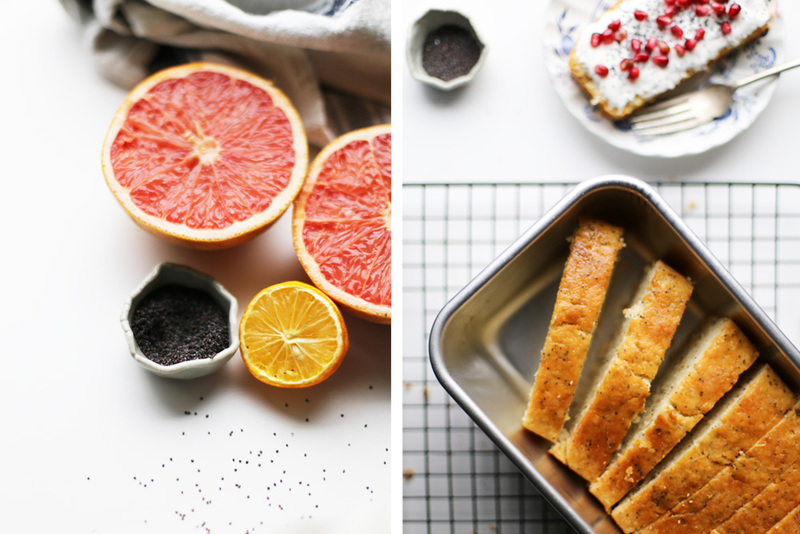 Meyer lemons are my favourite so I think those would go well if you substituted the grapefruit. Mum was telling me about your Bahamas trip. I am jealous! It would be nice to see the sun after this long rainy and cold winter. Jane after soooooo long. I guess blog Jane is incognito, right? I was thinking of you the other day. Hope you’re enjoying work. Aww please send your mother my love and best wishes to get well. So now you’re an aunt, and an adoptive one with what I understand? Congratulations and enjoy playing with little Jacob! Yes! My elder sister and her husband adopted a baby boy. Unfortunately, I cannot play with him because he’s in India. Thanks for your comment Sofia. Always nice to hear from you.